My oldest son (Bookworm1, age 5) would seem to take after his father though and loves games. When he wants to play something more heady, Daddy plays with him. Call Mommy in for games like Candy Land, Hi Ho Cherrio! or Don't Break the Ice. (Those types of games. I like those types.) When I saw an e-mail come through asking if I would like to review a copy of Simon Flash I thought it looked like something I would have fun playing with him so I said I'd be happy to take a look at it. Simon Flash arrived and judging by the looks of the box I wasn't so sure it would be a winner in this house. First, my husband eyed in suspiciously. (That's always a bad sign.) I figured it would be up to me to introduce the game. My moment came last week when all five of us simultaneously came down with a cold. I figured this game might prove diverting and so out it came. 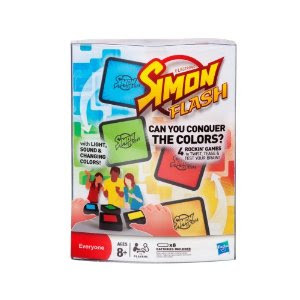 Featuring four brainteaser games to challenge your child's memory, speed, and logic, Hasbro's Simon Flash is a high-tech twist on the legendary Simon game. Four electronic cubes utilize light, sound, and changing colors to keep your child having fun and learning new skills during each game. Revolutionary Wonder-Link technology allows each cube to know where you've placed it, when you win a round, and keeps track of the score. 4. Simon Secret Color - you solve the puzzle by figuring out the order to place the cubes in. The game says it is for ages 8 and up but, as I mentioned, Bookworm1 is 5 and this game is perfect for him. The kid thinks in patterns and numbers though so I think that helped to make the Simon Classic version of the game approachable and easy. (He actually beats me when it comes to following the color pattern for the longest period of time.) Now, Bookworm1 has a hard time with Simon Shuffle because you have to move the lit squares around fairly quickly and his hand-eye coordination is not that great. Bookworm2 (age 2 3/4) really, really loves this game but he stinks at it. Definitely need to be older than two to play it, no matter how fun it looks. (Bookworm3 - age 9 months - is also a huge fan of the color flashing cubes and would like to eat them.) The good thing about Bookworm2 wanting to play it, however, is that it encourages him to learn his colors so that he can actually win the games! Because the game is all about colors and flashing lights, it is hugely attractive to younger people. As it is a game of speed and pattern (but is somewhat simplistic in nature) it holds appeal to those of us who do not wish to expend too many brain cells when playing a game, but will occasionally accept a minor challenge in this department. On the whole, this mom is going to give this game two thumbs up. (It was also a perfect game to have around when everyone was sick and down and out. Bookworm1 laid on the couch for awhile playing the Classic Simon version of the game and we just passed it back and forth between us.) It's a low-key, low stress game and I like it very much for that. I don't know that I would have purchased it outright for our family because it just doesn't look like much from the packaging. My husband, being infinitely suspicious of new games, would have definitely passed it by. But I think it is surprisingly usable in teaching colors and patterns in a fun, flashy sort of way. The great news for YOU is that Hasbro has offered to giveaway one copy of Simon Flash to one of you! To win? Simply leave a comment below. This contest will be open through Wednesday, December 21st and is open to U.S. Residents only. Please leave a valid e-mail address along with your comment so that I can easily contact you, should you be selected as the winner. Ah, what a walk down memory lane! We had a handheld Simon game when I was a little girl! My girls (and the DLM, no doubt) would LOVE this! Sign me up! I think my husband and M would love this. I think my son would like the colors and try to play, too. I've been eyeing this, in part for entertainment on the long drive to Grandma's. I hope I win this one! Looks like fun!! Thanks for the giveaway! What a fun game!! I remember playing this game when I was a little kid. I would love to win this for my kids! Thanks for the chance! I LOVE games!! Hubby and I had a no game rule before kids because we are both so competitive we didn't have fun playing just the 2 of us. Now we have a highly competitive first born. :D In fact, there are 2-3 classic board games under my tree right now. On a completely unrelated note, did you know Hasbro is based in Rhode Island. A few years ago the RI tourism board placed giant Mr. Potato Heads all around the state. I think my daughter would like this! Intriguing. Eric and I love games, and I think our kids are following in our footsteps. I would love to win -- thanks! We are also a divided gamer family. Kyle and I like to play, and Terry definitely does NOT. Amanda is sort of lukewarm at this point. This looks like a fun game! I loved playing as a kid and would love to win this for my nephew. I used to love Simon when I was a kid. Count me in for this one!